Because rendering scenes requires a lot of computer resources, and playback in Harmony does not always keep up with the scene's framerate, it may be difficult to decide how to preview your animation as you're working on it. Exporting OpenGL frames gives a more convenient alternative. OpenGL is the name of the engine used to display your scene's content as you are working on it. Hence, exporting OpenGL frames basically means you're exporting frames as they are usually rendered in the Camera view: Without antialiasing, compositing or effects. 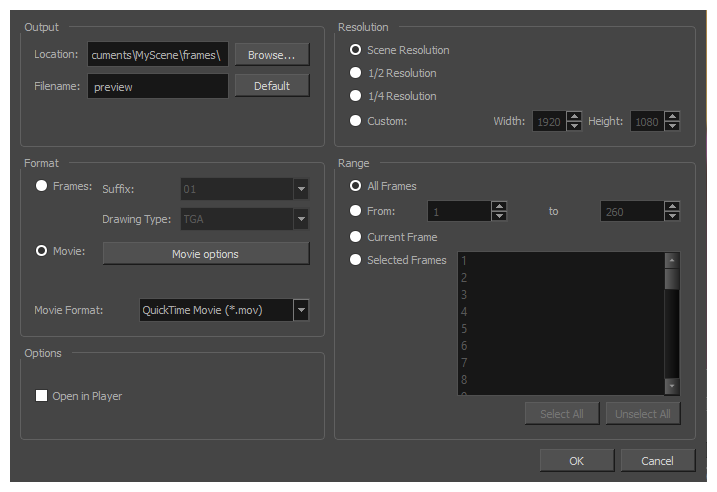 This is significantly faster than exporting your final frames, and can allow you to preview your animation in real-time without having to wait for a render. In the top menu, select Play > Record and Play. In the playback toolbar, click and hold the Render and Play button, select Record and Play to set the button to Record and Play mode, then click on the button again. From the top menu, select File > Export > OpenGL Frames. The Export OpenGL Frames dialog box opens. In the Output section, click Browse and select the directory where you wish to export the frames. In the Filename field, enter a file name for the file to export. If you're exporting frames as individual images, the specified file name will be used as a prefix, and the frame number will be used as a suffix. To use the default file name, click on Default. In the Format section, select Frames if you want to export each frame as an individual image, or Movie if you want to export a QuickTime movie file. Select a numbering format in the Suffix dropdown. The numbering format determines how many digits to use for the frame numbers. For example, if the Suffix is set to 001, the first frame will be numbered 001, the second one will be numbered 002, etc. If you are exporting frames, select an image format from the Drawing Type dropdown—see Image Formats for Rendering Write Nodes. NOTE A lot of formats are listed as their file extension, but some also have suffixes to indicate how they are encoded. For example, PNGDP4 means PNG: double precision with 4 channels, which means the exported PNG images will have 16 bits per channel instead of 8 bits, and will also have an alpha (transparency) channel. Quick Time Movie (*.mov): Available on Windows, macOS and GNU/Linux. Windows Media Video (*.wmv): Available on Windows only. NOTEOn Windows and macOS, Apple QuickTime must be installed in order to export QuickTime movies. On GNU/Linux, Harmony uses a more limited, open source QuickTime-compatible library which does not require additional software. If on Windows and exporting in Windows Media Video format, click on Movie Settings to open the Windows Media Video Settings dialog box—see Configuring Movie Settings for Windows Media Video. If your video format is QuickTime Movie and you're on a GNU/Linux machine, click on Video Options to configure the video compression settings for your movie file, or on Sound Options to configure its audio compression settings—see Configuring Movie Settings for QuickTime Movies on GNU/Linux. From the Resolution section, select a resolution for export. If you are running some quick tests, then you might want to reduce the resolution to save on exporting time. You can also select the Custom option to specify the desired Width and Height of your exported frames. If you want to export the current frame, select Current Frame. If you want to export specific frames, select Selected Frames, then click on each frame you wish to export in the frames list to the right. You can also click and drag to select a range of frames in the list. If you want to remove a frame from your selection, simply click on it again. In the Options section, select the Open in Player option to view the rendered frames.